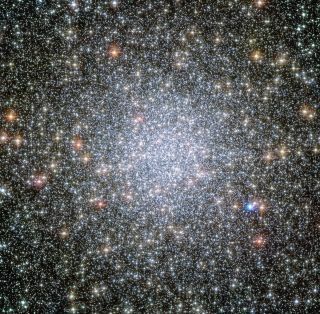 Crowded globular star clusters like this one, called 47 Tucanae, may be the best place to search for signs of interstellar alien civilizations, scientists say. The relative close proximity of stars could allow a spacefaring civilization to explore neighboring stars. KISSIMMEE, Fla. — Densely packed groups of stars may make excellent cradles for complex space-traveling life to evolve. Despite studies that claim these environments, known as globular clusters, may be too harsh for life, a new study argues for a more optimistic view based on the evolving understanding of where planets lie outside the solar system. The advanced age of globular clusters means their stars are older, as well. The heavy elements found in younger stars, which are made up of previous generations, aren't found within the hearts of globular cluster stars. This material, which would have been missing from the disks of dust and gas that built the star, is also required to build planets, so some scientists argue that worlds also would be missing from globular clusters. But Di Stefano and her colleague Alak Ray, of Tata Institute of Fundamental Research in India, pointed out that stars have been found around noncluster stars that lack significant amounts of these elements. Although massive gas worlds tend to orbit stars with heavier elements, smaller rocky worlds that resemble Earth can be found around stars with varying amounts of the material. "It's premature to say there are no planets in globular clusters," Ray said. The dense population of the clusters also raises concerns about their habitability. The sun's nearest stellar neighbor lies about four light-years (24 trillion miles, or 39 trillion kilometers) away. In a globular cluster, neighboring stars could be as much as 20 times closer. If a nearby star came too close, the effects of its gravity could fling a planet from its orbit. In this case, the older age of the stars is an advantage. Di Stefano and Ray noted that bright stars like the sun would have been born, lived and died, leaving behind only faint, long-lived dwarf stars. These dimmer stars would require planets to orbit closer to their sun in order to maintain liquid water on their surface — a key requirement for the evolution of life as we know it. Their close orbits could help shield them from interactions with passing stars, according to a statement from the Harvard-Smithsonian Center for Astrophysics (CfA). The presence of an old star could also indicate an older planet. On Earth, life is thought to have evolved after about 3.5 billion years. According to the CfA statement, a 10-billion-year-old planet would give life time to not only bloom, but evolve into intelligent and technologically advanced beings. Life on these ancient worlds would have had ample time to become a spacefaring species. "Once planets form, they can survive for long periods of time — even longer than the age of the universe," said Di Stefano. While nearby stars may cause planets to be less stable, they can be a boon for interstellar travel. With nearby stars in galactic clusters as much as 20 times closer than the sun's nearest neighbors, the opportunities for potential exploration, settlement and communication could be enhanced, the new study suggests. "We call it the 'globular cluster opportunity,'" Di Stefano said. "Sending a broadcast between the stars wouldn't take any longer than a letter from the U.S. to Europe in the 18th century." Communication directed from one star in a globular cluster to the next could help scientists to spot advanced civilizations, CfA's statement added. Targeting globular clusters with SETI search methods could reveal radio or laser broadcasts sent from one stellar system to the next. Messages wouldn't be the only things that could pass between the stars — spaceships could travel more easily from one system to the next, Di Stefano noted. "The [NASA] Voyager probes are 100 billion miles [160 billion km] from Earth, or one-tenth as far as it would take to reach the closest star if we lived in a globular cluster," Di Stefano said. Launched in 1977, Voyager 1 and 2 were sent to the outer solar system. After passing the gas giants, the two probes continued on to the edge of the solar system and into interstellar space. "That means sending an interstellar probe is something a civilization at our technological level could do in a globular cluster," Di Stefano said.